Citizen Jane: Battle for the City is a story about our global urban future, in which nearly three-fourths of the world’s population will live in cities by the end of this century, a story about our future as informed by our past. The film brings us back mid-century, on the eve of the battles for the heart and soul of American cities, about to be routed by cataclysmically destructive Urban Renewal and highway projects. 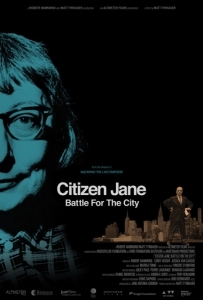 One woman, Jane Jacobs, a journalist takes on the unlikely and difficult role of activist clashing with top urban planners and politicians to assert her believe that “people make cities, not buildings.” Like Jacob’s inspired protests within the city, the film is a battle-cry for the change citizens can create when inspired. *Special Guest Speaker (via skype): Director Matt Tyrnauer– Tyrnauer’s writing career began at Spy magazine and The New York Observer. Tyrnauer is a partner in Altimeter Films, which he co-founded with Corey Reeser. Altimeter is a Los Angeles-based entertainment company, specializing in documentary and narrative film, television, and branded content. Tyrnauer is also an award-winning journalist, who has written many feature articles for Vanity Fair, where he has been editor-at-large, special correspondent and is now a contributing editor. Tyrnauer’s feature film, Valentino: The Last Emperor, has been called “flawless” by Richard Corliss of Time, and a “must-see” by The New York Times. Valentino premiered at the 2008 Venice Film Festival and won the top documentary prize at the Chicago Film Festival. It was one of the highest-grossing documentaries in 2010, and was short-listed for an Academy Award for best documentary feature.